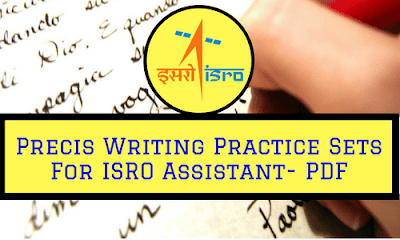 Those who have enrolled in our 30-Days Crash Course For ISRO Assistant Exam can now download the workbook of Precis Writing Practice Sets which has 20 sets for practice. The PDF has two formats one is Desktop Friendly and the other one is in Mobile Friendly format. Enrolled students are requested to solve the sets and send their precis for review and checking.